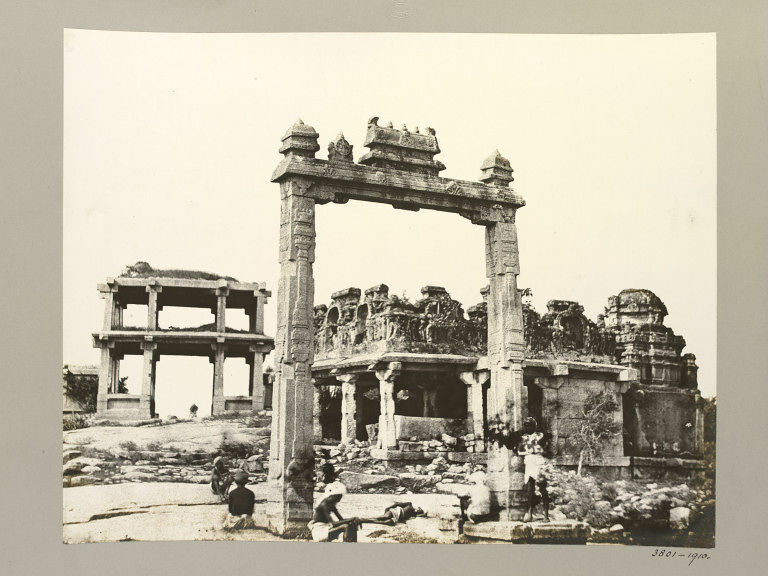 Hampi (Vijayanagar) Bellary District: 'King's Balance'. 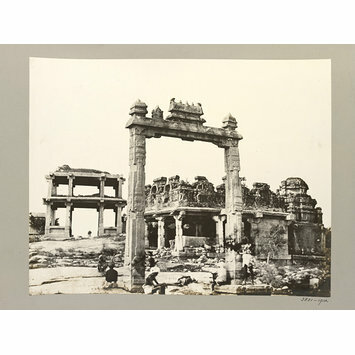 This photograph shows a structure known as the 'King's Balance', Hampi (Vijayanagara). This photograph shows an oblique view of a freestanding, ornate post and lintel squared arch around which are a number of figures posed presumably to indicate scale. Behind this structure is a squat pavilion with stone awnings and a parapet heavily ornamented with carved niches and sculptures. Beyond is a simple two storeyed gateway structure with squared pillars and bays to either side of the central opening. The 'King's Balance' and surrounding structures are found in the sacred centre near the southern banks of the Tungabhadra close to the Vitthala temple complex. The 'King's Balance', probably a swing for images of the gods on festival occasions or a balance to weigh gold against the king, consists of two carved columns and a lintel with a stone loop. The metal balance or swing which would have been suspended from this loop has vanished by the time this photograph was taken. The river's edge has receded considerably since this photograph was taken.